I remember walking into my first conference nervous as I could be! A fresh face to everyone, the Blue Lt. Governor from Detroit Renaissance, just a girl who loved playing tennis, dancing, youtube, and Ariana Grande carefully finding my way through MYIG, all its twists and turns and what it had to offer. Looking back on that moment, is as clear today as it was then. And if you told me then I would be where I am now, I would have never believed you. 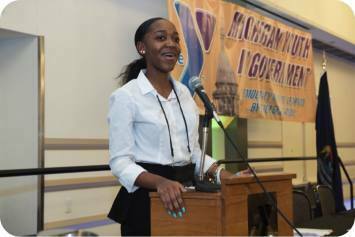 But the girl I am today I owe to MYIG and the way this program helped shape me into the leader I have become. I fell in love with YIG as soon as I came! As I was introduced to leadership, respecting others, caring, and honesty, I was able meet new people and make friends not just for the conference but forever! This was the ultimate learning experience! I learned how to debate with others, stay positive in the face of adversities, and just have fun! This is what prompted me to run for Youth Governor, to be that person to spearhead those memories, lifelong friendships and genuine fun as leadership at this conference. To make MYIG a place where progress is achieved with open minds and a bond created through leadership and strengthened by our passion for government. I believe we all have the potential to succeed we just have to unlock it. And as Youth Governor I want to give you that key to unlock your own potential within yourself. This is my story and to whoever reads this I hope someday you may have the opportunity to share yours too! It is truly an honor to be serving you this year as your Youth Governor! I am so excited start our path on this journey to success through leadership. As we go through this time together, I wish for everyone to embrace and believe in themselves. Stay confident, and have that “go for it attitude”! I look forward to seeing and working with you all soon!